Nestled below the Ko’olau pali and Mt. 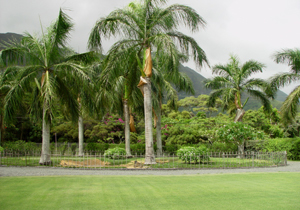 Olomana in beautiful Waimanalo Valley, Quality Turfgrass grows Hawaii’s highest quality turfgrasses, including our exclusive patented ‘Z-3’ zoysiagrass. Our staff are top lawn professionals with many years of experience in installing and maintaining lawns. Their expert advice will guide you to guaranteed lawn success. Come visit us, and enjoy your day in the country. Bring the kids and the dogs, and have a good time playing on the stunning sample lawns you’ll find at our farm. You’ll find a warm welcome.